I must like these little buildings. I have a habit of doing these drive-by picture shootings of them. Since you folks up North are having yet another Nor'Easter, another blanket of snow, I thought I'd share what it looked like here on Sunday. The pollution from the Gulf never arrived. The beaches in Fort Lauderdale are still pristine in 2011. The weather that day hit the low 80s, although we're going to have a cold snap today with a high of just under 70F. The breezes are coming from the wrong direction today which means the front has passed through. Granted it is not yet 8AM of this writing and the "Marine Layer" has not burned off. The palms are swaying, the parrots are screeching through the sky like a flyover of a different kind of Blue Angels. I haven't seen an Iguana in a year here in Wilton Manors so we can expect a safe walk without them falling from the skies. Yes, you get snowfalls, we get Iguana Falls. Or we did. Now they're hiding at the river banks and closer to the intracoastal. This may be Florida but we have some rather odd micro-climates. I'm in Broward County which is the warmest zone in the state according to the USDA's current map. The Keys supposedly get cooler which surprised me until I watched the last cold front come through and we were 5F warmer on average than Key West in Fort Lauderdale. Maybe Paradise is defined by degrees... Five of them in this case. I did manage to squeeze off some pictures on Sunday. I'll post them here and there. 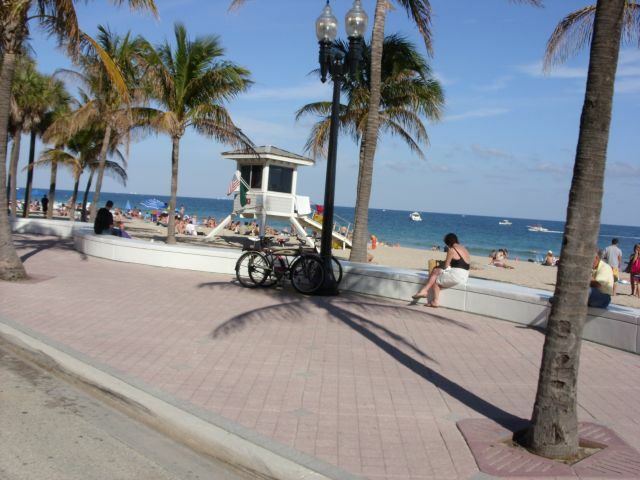 The nice thing is that when you go for a drive in South Florida and get stuck in traffic on A1A, you get to see this kind of scene.